China invented fire making and of course invented various cheap basic electronic things for DIY works. And a Japanese discovered first version of Tikka Kebab Circuit Design. Here is how to around creating circuits with wire, resin, soldier and no PCB. Our previous ways were designing PCB at home, using wire wrapping with breadboard design perfboard etc. Inventor named the way “”0’baka” means stupid. Oddly in Bengali language closer sounding word “boka” also means stupid and “baka” is bent. Other peoples made it more advanced. Total thing is better to name as Tikka Kebab Circuit Design. Sooner or later professors of engineering schools will teach these methods religiously, ask difficult questions on them. We will suggest to think using SMD components for making smaller with Lego like design. The methods are written on their websites and really there is nothing to add apart from thinking ways for easy resin casting and heat dissipation. Haksons Resin is quite cheaper and good quality in India. You’ll get on Ebay, Amazon etc. Of course there is Silicone for moulding and hundreds of materials used in Orthopaedics for casting. If you most hard, opaque material to pour, nothing can beat dental plaster. Instead of making it fully inside cast, you can only create a PCB like plate to support the wire, make the side walls and a top lid. Components will remain outside and cooling will be easy. Altogether these are Tikka Kebab Circuit Designs. 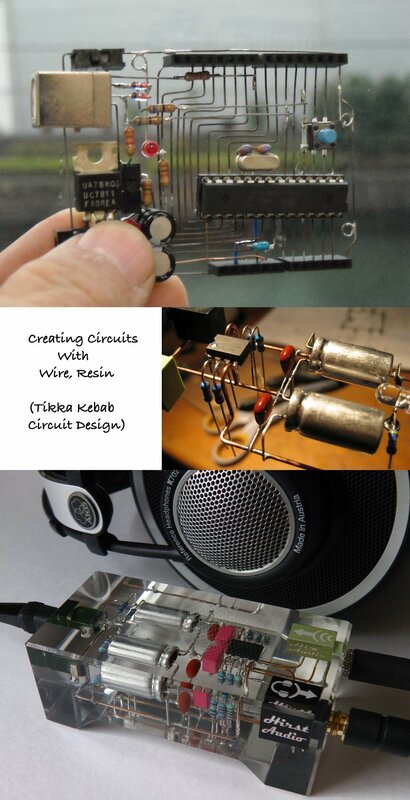 Cite this article as: Abhishek Ghosh, "Creating Circuits With Wire, Resin (Tikka Kebab Circuit Design)," in The Customize Windows, June 10, 2017, April 21, 2019, https://thecustomizewindows.com/2017/06/creating-circuits-wire-resin-tikka-kebab-circuit-design/.